I'm an obsessive person. When I was a kid, I flitted every few years from one life's purpose to another: the works of Stephen Sondheim, Victor Hugo, the Burke and Hare murders. I was nothing if not eclectic. As a grown-up food writer, I'm slightly better adjusted, but when I taste something truly special, it happens all over again. Such was the case a few months ago when I had my first Mint Chip smoothie at Eco Bean & Juice in Burlington. In the depths of winter, I needed somewhere to stop after a spinning class at REV. I'd never thought of myself as a "smoothie person," but my mind was open — I'd never considered myself a spinning person, either. As a lifelong devotee of mint chocolate chip ice cream (I still swear by the ones at Baskin Robbins and La Crémaillère in Bedford, N.Y., my lowbrow and highbrow childhood favorites), the choice was a no-brainer. Raspberry-chia-peach and Nuts About Acai — made with acai, berries, peanut butter and protein powder — sounded attractive. But any foodstuff with fresh mint high on the ingredient list is my first choice. And so the love affair began. 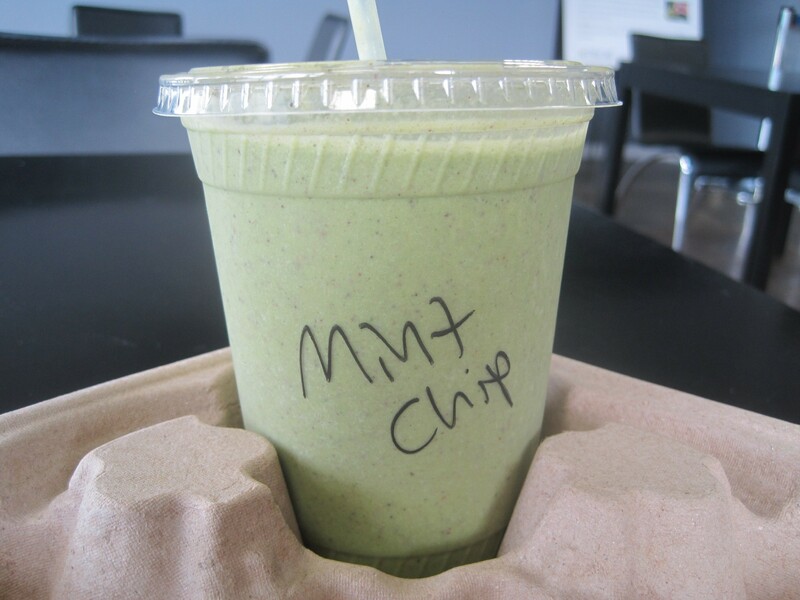 Mint is the refreshing base of the Eco Bean smoothie, but the soft green color comes just as much from spinach, a secret that you can see but not taste. The "chips" are tiny shards of raw cacao, small enough so that they're not bitter. Even if they were, banana, raw honey and almond milk would likely mitigate it. Basically, it's a grown-up-tasting chocolate chip mint shake with hidden vegetables and protein in it. It was lust at first taste, but my fervency for the drink hasn't cooled even as the weather finally turned hot. I had one yesterday, and I'm ready for another RIGHT NOW. Alice's Latest Obsession is an occasional blog series that appears when food writer Alice Levitt is newly preoccupied with a dish, restaurant or product. As John Waters wrote in his film Pecker, "Life is nothing if you're not obsessed."